When you get a new door, installing it correctly and making sure all of its moving parts glide smoothly should be a top priority. 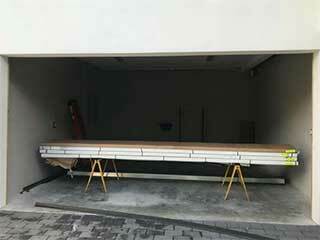 Garage door installation covers assembling the panels, laying the tracks, and fitting the springs, cables, and torsion rod into their correct positions. We check the track alignment before we tighten everything up, making sure that the rollers and trolley can move freely with no impediments. Whether your door comes with extension or torsion springs, we make sure that they are correctly placed to evenly counterbalance the door and prevent uneven wear. Installing the parts of the opener requires special attention, especially if the driver is a jackshaft with its accompanying tension cables. Let us worry about checking the details of cable placement and spring tightness. Our professional technicians work to make sure that everything is perfect before we complete the project. If your new door jerks and shakes, it doesn't matter how good it looks. A beautiful new door that glides easily, swiftly, and quietly will definitely make your neighbors jealous. Allow us to help you give your home the facelift it deserves with professional garage door installation that ensures a perfectly working door for years to come. Our technicians are qualified to do professional installations to make swapping your door a piece of cake. Our technicians are dedicated to customer satisfaction. When you have us install your new garage door, you're guaranteeing yourself a hassle-free experience. Contact Garage Door Repair Delray Beach to learn more about our professional installation services and other services we offer.